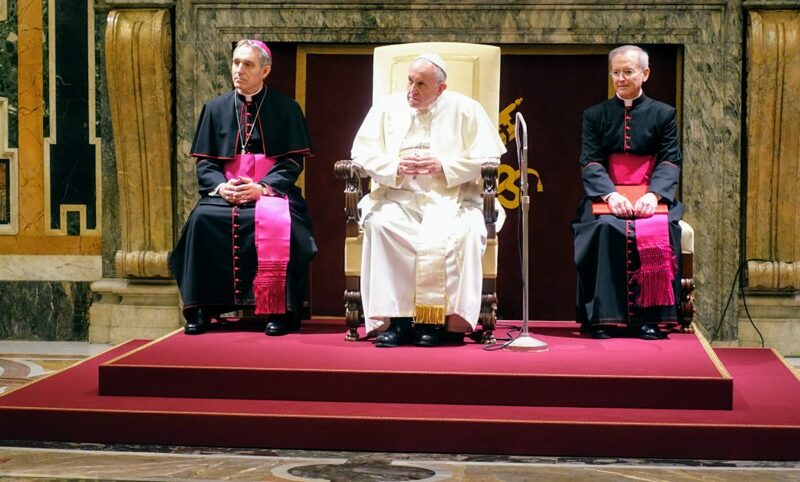 Most of us were very excited on Friday the 8th of February, as we were being invited by the successor of Peter at a private audience in the Vatican. The two General Councils, brothers and sisters from the two congregations, a few provincials already in the house for the forthcoming provincials’ encounter with the GC, some 80 persons all together were well in time to meet the Pope at 11am. The number of steps we had to climb was, to the least, very impressive, but finally there we were in the Clementine Hall, waiting for our Brother and Pastor Francis. A very official encounter, very comforting and meaningful to each one of us. It is with great joy that I welcome you to the celebration of the 150th anniversary of the foundation of the Society of Missionaries of Africa and the Congregation of the Missionary Sisters of Our Lady of Africa. In thanking your Superiors General for the words they have addressed to me, I wish to express my cordial greetings and spiritual closeness, as well as through you, to all the members of your Institutes, present in Africa and in other parts of the world. Thank you for the service of the mission of the Church, lived with passion and generosity, in fidelity to the evangelical insights of your common founder, Cardinal Lavigerie. Over the past three years, you have been preparing to celebrate this jubilee. As members of the great “Lavigerie family”, you have returned to your roots, you have looked back on your history with gratitude, to give you the means to live your present commitment with a renewed passion for the Gospel, and to be sowers of hope. With you, I give thanks to God, not only for the gifts he has given to his Church through your Institutes, but also and above all, for the fidelity of his love that you celebrate with this Jubilee. May this Jubilee Year strengthen in you the assurance that “God is faithful, he who has called you to live in communion with his Son, Jesus Christ our Lord” (1 Cor 1:9). May your consecration, your ministry thus be able to manifest concretely, in your fraternal life and in your various commitments, the fidelity of God’s love and its closeness, to sow hope in the hearts of those who are wounded, tested, discouraged, and who feel abandoned so often. Dear friends, you know that when Bishop Lavigerie, then Archbishop of Algiers, was led by the Spirit to found the Society of Missionaries of Africa, then the Congregation of Missionary Sisters, he had in his heart the passion for the Gospel and the desire that it be proclaimed to all, making himself “everything to all” (cf. 1 Cor 9:22). For this reason, your roots are marked by Mission ad extra; it is in your DNA. Thus, following in the footsteps of your founder, your primary concern, your holy concern, “is that so many of our brothers and sisters live without the strength, light and consolation of the friendship of Jesus Christ, without a community of faith that welcomes them, without a horizon of meaning and life” (Apostolic Exhortation Evangelii Gaudium, n. 49). But, in the light of the journey made since your foundation, you know that the proclamation of the Gospel is not synonymous with proselytism; it is this dynamic that leads us to be close to others, to share with them the gift received, the encounter of love that has changed your life and that has led you to choose to consecrate your life to the Lord Jesus, Gospel for the life and salvation of the world. It is always with him, through him and in him that the mission is lived. So I encourage you to keep your eyes fixed on Jesus Christ, so that you never forget that the true missionary is first and foremost a disciple. Have at heart to cultivate this particular bond that unites you to the Lord, by listening to his Word, celebrating the Sacraments and serving the brother, so that your words and actions may manifest his presence, his merciful love, his compassion to those to whom the Spirit sends you and leads you. May the celebration of your jubilee thus help you to become “nomads for the Gospel”, men and women who are not afraid to go into the deserts of this world and seek together the means to lead their fellow human beings to this oasis that is the Lord, so that the living water of his love may quench all their thirst. May this Jubilee Year also contribute to the development of fraternal bonds between you, because the proclamation of the Gospel can only be lived at the price of true missionary communion. With the strength of the Holy Spirit, be witnesses to this hope which does not disappoint (Cf. Rm 5:5), despite the difficulties. In fidelity to your roots, do not be afraid to venture out on the paths of mission, to witness that “God is always a newness, which urges us to leave without respite and move beyond what is known, towards the peripheries and borders” (Apostolic Exhortation Gaudete et exsultate, n. 135). May the Holy Spirit make you build bridges between people. Where the Lord has sent you, contribute to the growth of a culture of encounter; continue to be the servants of a dialogue that, while respecting differences, knows how to be enriched by the difference of others. And I thank you in particular for the work you have already done in the service of dialogue with Islam, with our Muslim sisters and brothers. Through the style and simplicity of your lifestyle, you also demonstrate the need to take care of our common home, the land. Finally, in the wake of Cardinal Lavigerie, be sowers of hope, fighting against all current forms of slavery. 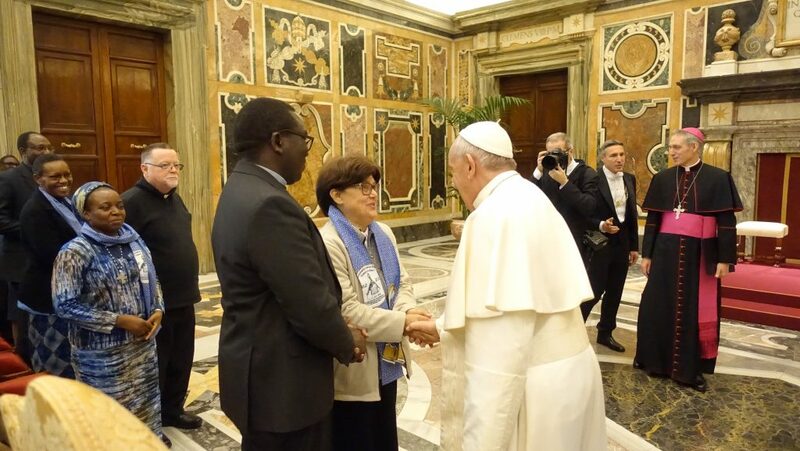 Always seek to be close to the small and the poor, to those who expect, at the periphery of our societies, to be recognized in their dignity, to be welcomed, protected, raised, accompanied, promoted and integrated. 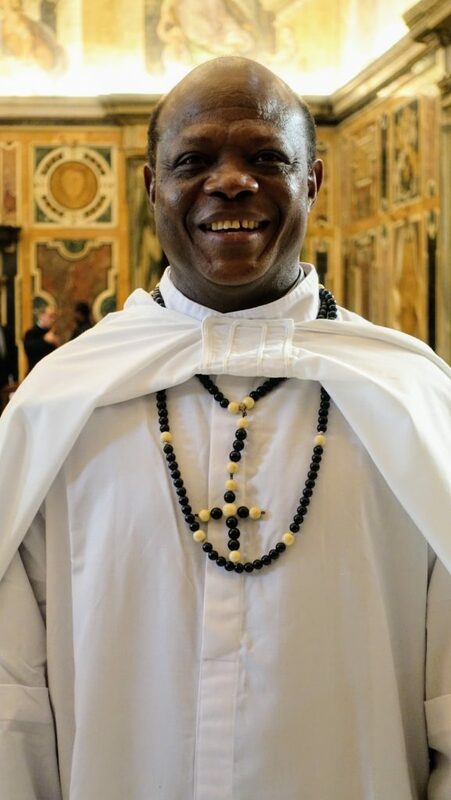 With this hope, by entrusting you to the Lord, through the intercession of the Virgin Mary, Our Lady of Africa, I give you and all the members of your communities the Apostolic Blessing and I call upon God’s blessings on those whose lives you share, where the Lord has sent you. And, please, don’t forget to pray for me. Thank you.